Banshees are a card thrower's dream. Engineered for maximized durability, cutting and penetration power. INCLUDES 10 minutes of online instructions by the World Record holder in card throwing! A fusion of card throwing awesomeness -- with a sonic scream. Card throwers destroy dozens of decks while practicing their throwing. Banshees are engineered with a blend of high-grade plastics to maximize cutting and penetration power, all while keeping the cards extra-durable so you don't waste money on ruined cards. INCLUDES 10 minutes of online video instructions excerpted from Velocity DVD by Rick Smith Jr.-- the Guinness World Record holder in card throwing. Learn how to throw cards for speed, distance and accuracy! Banshees were conceived, developed and designed by acclaimed playing card creator Jason Brumbalow after hearing a card thrown by World Record Holder, Rick Smith Jr., make an audible whistle. This led to the idea of practice playing cards designed exclusively for throwing, that could withstand hundreds of throws, and that made an audible 'cry' when slicing through the air. But you don't have to be a major league pitcher to create an impressive sonic boom. These cards have a uniquely shaped, die-cut, set of holes, designed to optimize the signature 'scream' while ripping through the air. For those who want to keep track of their increasing stabbing power, a special measuring system is included on the faces. The edges have been bevel cut to maximize carving and penetration ability. 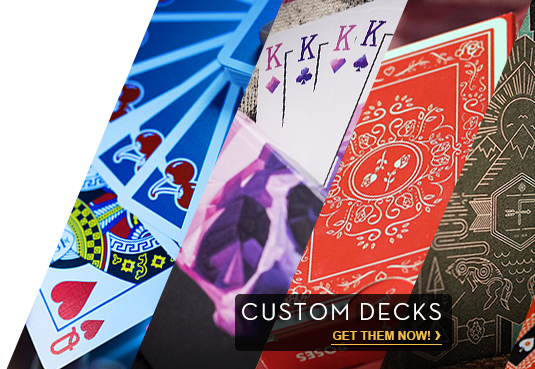 Banshees are the result of an unyielding attention to craftsmanship and the first ever playing cards that are the new standard to creating impact with your card throwing. Want to learn how to throw like the pros? Achieve optimal throwing power and preciseness by purchasing Velocity by Rick Smith Jr. on DVD. No other video lets you in on this much card throwing technique and performance information. NOTE: Second Edition Banshees info - Tuck box is matte. "Second Edition" is on the front of the box.